StarTimes Media has today announced its acquisition of the 2018 FIFA World Cup broadcast rights as FIFA officially granted media rights to all 2017-2018 tournaments. The company has secured the pay television transmission rights for exploitation in Kenya and other territories across sub-Saharan Africa. 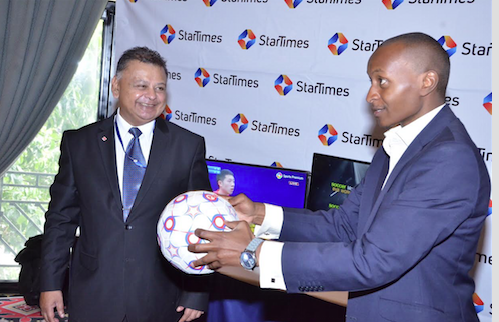 While making the announcement, StarTimes Vice President Mr. Mark Lisboa noted that the acquisition of these media rights is a milestone that will enable more Kenyan households enjoy access to the prestigious tournaments through the company’s affordable pay television platform. “We are delighted to secure the broadcast rights to the 2018 World Cup, a tournament that every soccer fan across the globe looks forward to every four years, the fact that StarTimes will bring this showpiece to Kenyan households is a great breakthrough as it demonstrates our progressive commitment to provide access to premium content at the most affordable subscription costs,” noted Mr. Lisboa. StarTimes is set to broadcast all the 64 World Cup matches live, a first for the broadcaster having made significant inroads towards securing major sports properties where the company currently broadcasts The Bundesliga, Serie A as well as the Chinese Super league exclusively. The various FIFA tournaments are therefore a strong addition to the company’s offering as it seeks to stamp its authority in the broadcast of key sporting events. “It is important to note that StarTimes will also broadcast other FIFA tournaments including the under 20 and under 17 World Cup as well as the FIFA Confederations Cup between May – October 2017 which is testimony to our commitment to service excellence enabling us to serve up a football feast to Kenyan football fans in the coming days,” added Mr. Lisboa. Interestingly, the company’s subscribers will be in a position to enjoy these prestigious tournaments from as little as Ksh 599 per month where subscribing to basic bouquet, Classic or Unique bouquet that retail at Ksh 499, 999 and 1,499 respectively, will enable households to access to all the live matches and more. The same will be available from as little as Ksh 899 on Smart bouquet and Ksh 1,499 for Super bouquet on the StarTimes satellite television platform. Did Safaricom beg Uhuru to Halt Equity’s thin SIM cards?